The Malaysia International Halal Showcase (MIHAS) is all set to return for its 14th edition at the Kuala Lumpur Convention Centre from April 5 to 8. MIHAS is organized by Malaysia External Trade Development Corporation (MATRADE), the country’s trade promotion agency under the patronage of Ministry of International Trade and Industry. MIHAS 2017 will showcase not only Malaysian capabilities, but also international companies in the global halal industry. Sectors promoted in this event include food and beverage products, pharmaceuticals, cosmetics and machinery, among others. Besides products, sharia-compliant services will also be featured, particularly financial services, halal logistics, e-commerce and tourism. Complementing MIHAS 2017 will be the inaugural Malaysia International Islamic Lifestyle Exhibition (MILE), an event organized in parallel with MIHAS to promote Islamic lifestyle products. The MILE aims to promote clusters such as modest fashion, Islamic education and literature, Islamic arts, IT and multimedia, jewelry and ornaments, as well as social and community development. To stimulate business deals during the event, MATRADE will be coordinating its signature business-matching initiative, the International Sourcing Programme (INSP), to match foreign buyers with Malaysian exporters. This high-impact business meeting will be able to foster business relationships among industry players from around the world. MIHAS last year recorded a value of 1.14 billion Malaysian ringgit (¥29.14 billion), an increase of 4 percent from 2015, generated from the exhibition and INSP sales. According to MATRADE Chief Executive Officer Ir. Dr. Mohd Shahreen Zainooreen Madros, MIHAS is a key annual event for Malaysia as it has the capability to strengthen the country’s position as a global hub for the Islamic economy. “Malaysia’s conducive Islamic economic landscape is exemplary to many nations, which has resulted in the strong positioning of MIHAS around the world. MIHAS is also a testament to the government’s efforts to promote and market Malaysian companies’ halal products and services to the world, without local companies having to travel overseas,” Mohd Shahreen said. MIHAS 2017 will host over 550 exhibitors from more than 30 countries, including ASEAN member countries, Turkey, Brazil, South Africa, Palestine, Iran, the United Arab Emirates, China, Japan, Taiwan and South Korea, just to name a few. Last year, 543 companies from 29 countries participated in the event and it welcomed more than 22,000 visitors. This year the number of visitors is targeted to reach 25,000 people. The visitors comprise trade representatives from local and international organizations, associations, foreign delegations and others. The halal industry has been growing for the past decade and much of this robust expansion is fueled by the high demand from not only Muslims but from non-Muslims, too. Inaugurated in 2004 with the vision of becoming a global halal marketplace, MIHAS has earned a reputation as the world’s largest halal trade fair. 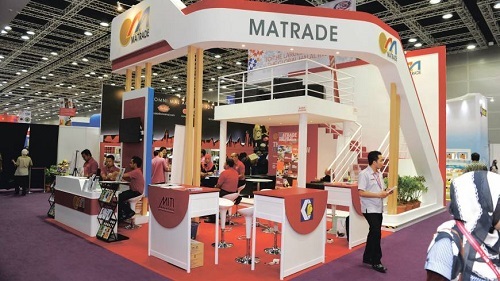 MATRADE was established March 1, 1993, as Malaysia’s external trade promotion arm under the patronage of Ministry of International Trade and Industry. Its functions are: 1) to promote, assist and develop Malaysia’s external trade with particular emphasis on the export of manufactured and semi-manufactured products and services; 2) to formulate and implement export marketing strategies and trade promotion activities to boost Malaysia’s exports; 3) to undertake commercial intelligence gathering and market research, and create a comprehensive database of information for the improvement and development of Malaysia’s trade; 4) to organize training programs to improve the international marketing skills of Malaysian exporters; 5) to enhance and protect Malaysia’s international trade investment; and 6) to promote, facilitate and assist in the services areas related to trade. The text is an excerpt from a press release issued by the Malaysia External Trade Development Corporation.